On Monday, November 7, 2016, the unique and majestic 100-year old Norwegian tall sailing ship “HNoMS Statsraad Lehmkuhl” will be making it’s only United States appearance as it is scheduled to arrive at approximately 10:00am in Downtown Norfolk, docking at Otter Berth next to the future Waterside District. Norfolk, Virginia will be the ships only U.S. Port of Call for this cadet training vessel. The ship will provide public visitations during its stay and is scheduled to depart at approximately 3:00pm on Monday, November 14, 2016. Arrival and departure times are approximate and are subject to change due to any possible inclement weather. The Statsraad Lehmkuhl is sailed by the Royal Norwegian Naval Academy’s first year officer cadets who will be participating in leadership training, learning about the United States Presidential electoral procedures, visiting NATO headquarters and our local Navy bases, along with teambuilding during the trip. The cadets also get a strong foundation of basic seamanship during their weeks onboard. Stripped of modern communication and technology, the students are forced to work together to overcome the timeless challenges and dangers of travelling the seas by sail. Statsraad Lehmkuhl has been part of the basic training program since 2002, whereby the Royal Norwegian Navy leases the ship for several months every year. Norfolk has become a favorite port of call for the ship and her crew; this will be the 12th consecutive year that the ship has called on the City of Norfolk as part of their sail-training schedule. The port visit is sponsored by The City of Norfolk and Festevents, Ltd. Guests are encouraged to come witness the Statsraad Lehmkuhl’s arrival into port as the crew will be in uniform and positioned on the three-masts singing the ship into port on Monday, November 7, 2016. Public Visitation Schedule: The ship will be open for public visitation on Thursday, November 10, 2016, through Sunday, November 13, 2016, from 10:00am – 3:00pm. Please contact Festevents at 757-441-2345 or Festevents.org for official updates. Ship tours are free and open to the public. The Barque ‘Statsraad Lehmkuhl’ is from Bergen. 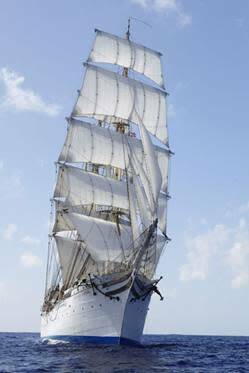 It is a three-masted Barque, launched in 1914. She was built by JC Tecklenborg, Bremerhaven, Germany and is Norway’s oldest and largest sailing vessel.